Today is the kind of early September day that makes me want to swallow the earth, imbibe all of its fragile enormity, fall down on my knees before its dazzling beauty and worship it with all the passionate zeal my amygdala can muster – accepting with humility the eucharist of this glorious blue globe. 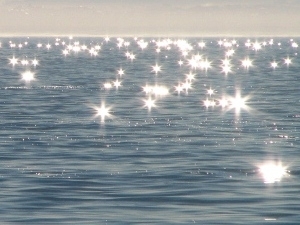 Today is the kind of day when my heart sparkles with the crystal clarity of the sky and ocean. Today I want to join those murmurations of tree swallows flowing in liquid synchrony, their morphing river an unvirtual kaleidoscopic screensaver against a cerulean sky as they scour the feastladen air for tiny fellow fliers whose bits of energy will fuel the trip to the swallows’ winter home.This morning is the kind of morning whose light makes the air itself a visible, tangible thing and reveals the fact that all that holds this essential life-sustaining aura against the earth and keeps it from flying off into the darkness of space is gravity! Today is the kind of day that makes me look at the migrating monarchs with respectful awe, imagining the miracle of their silent flight, fueled by sips of flower juice and taking them, pollutionless, from here to the mountains of Mexico – all in vivid contrast to the growling steel fabrications that carry us to Walmart while spewing streams of stuff to soil our personal space. Today is the kind of day where thousands of sunshards ricochet off perfectly angled wavelets and put to shame the bejeweled artifices of all history’s emperors combined. Today is the kind of day that makes me think, as the sea levitates in response to the pull of the rising moon, that you and the moon and the sea and I are all made of the same stuff and that the same force deforming our globe and lifting entire oceans of seawater moonward pulls on us. The force and the idea both stretch my mind, lift my spirits. For anyone who cares to listen, the whole of it plays like a great symphony – individual beauties blending in magnificent harmonies The music swells, expands, explodes like a grand fireworks show, then ebbs to a fragile poignant thread. Aldo Leopold heard it. So did Rachel Carlson. Are the two viewpoints reconcilable? I think so. The crucial word in Crane’s poem is the “I”. By getting the distinction between “me” and “it” into better perspective the distortions created by our sense of personal self-importance can be at least partially corrected and the tragedy of our inconsequential evanescence softened. Martin Buber explores the issue with his reflections on the I-Thou and I-it relationships. Zen “enlightenment” may be getting at the same thing by jettisoning the distractions of our personal cravings to achieve peace and understanding. So may the Old Testament’s description of man created in God’s image if thought of in its broadest sense with God being more the whole of Creation rather than some creator. And so is the modern conservation movement’s theme of recognizing that Homo sapiens is an inseparable part of nature – a reality which may explain why wilderness, given the opportunity, can be so spiritually uplifting. To begin to get things right, to correct the distortions, to reconcile our sense of self-importance with the vastness of time and the cosmos – requires merging the “me” with the “it” by giving ourselves to creation rather than having dominion over it, by giving the earth and things on the outside of our thin skins the same sacred value as the “us” and the “ours”. This needn’t involve asceticism or self sacrifice. Deep appreciation of the miracle of creation and the value and interconnectedness of all things is a place to start. Replacing self-satisfied certainty with curiosity about how a butterfly thinks is progress. And there is other brainwork that can help. The ideas of Copernicus and Galileo exposed the hubris of a geocentric universe. Jane Goodall showed us that tool-making didn’t make Homo sapiens so very special. Myriad researchers have proven that those bird brains do many things well beyond the capacities of ours. Carl Safina lays out plenty of evidence that other species have very complex systems of communications. And even within our own skin, we now know that, thanks to work of microbiologists at the Weizmann Institute, there are just about as many bacterial cells cohabiting the very space I call “me” as there are cells that bear my DNA! But even though we are not the center of the universe, not the only tool making species or the only one with a language, not even the only occupant of our own skin, we are singular in some ways: our species is growing in number faster than any other, we are rapidly depleting global diversity, we are steadily devoting the surface of our planet to the few types of organisms we can eat or wear and we seem to be dead set on turning the whole thing upside down by monkeying with the very air all of life breathes! So if we want to keep glorious September days like this one appearing every time we hit this part of our annual trip around the sun it’s time to do whatever we can to get things right. Thankfully, today is the kind of day that makes my mind strain at its moorings, to free itself to explore new ways of thought, to head off toward the horizon of its eye and explore uncharted waters. Today is the kind of crisp September day which makes me want to think with the clarity of its air and realize that my conceptual world is not as flat as it seems, that its horizon is really not the end of what there is and, as I hope and suspect, instead of that worn out image of an old guy with a beard reaching out to make stuff for his personal entertainment, the beyond reveals startling unimaginableness. Even if the success of such a mental voyage is a long shot, this is the kind of day which makes it feel right to give it a try.